Hi, Connie here with you today, sharing a pretty Fall Frame. I so love the look of Mega flakes, especially this jar which is called Autumn Blaze, it gives such a beautiful shine to the card and love those colors. 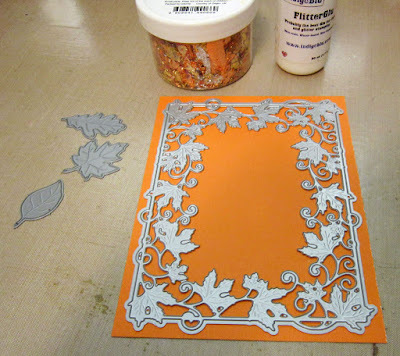 My tips are to start off with a piece of cardstock that is close to the color of the medium you are using, that way if it doesn't have a totally coverage it won't show up as much. 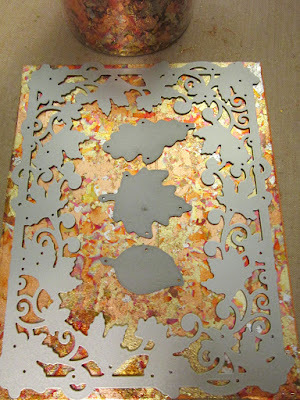 Cut your cardstock to the size of the die you are using and that way you won't be using more than needed of the mega flakes, although this stuff goes a very long way. I will have to make a confession here, I was going to use the Flitterglu you see in the picture with the mega flakes but when I did it, I put too much glue onto the cardstock and when I went to wipe away the access it made a big mess. The end project you see in the next picture was done using scortape over the whole piece of cardstock. My next tip is to make sure you use every bit of your cardstock cut other dies from the areas that will be normally just thrown away, I cut these all at the same time, I taped it all down with washi tape so it didn't move on me. As you can see I used those dies in this project too, using glue dots I added them to the base of the frame and added a piece of jute to them too. I used Spellbinders Labels Eight die to stamp the Paper smooches stamped sentiment from the Happy Birthday set. I added Wink of Luna gold pen to the sentiment stamp. 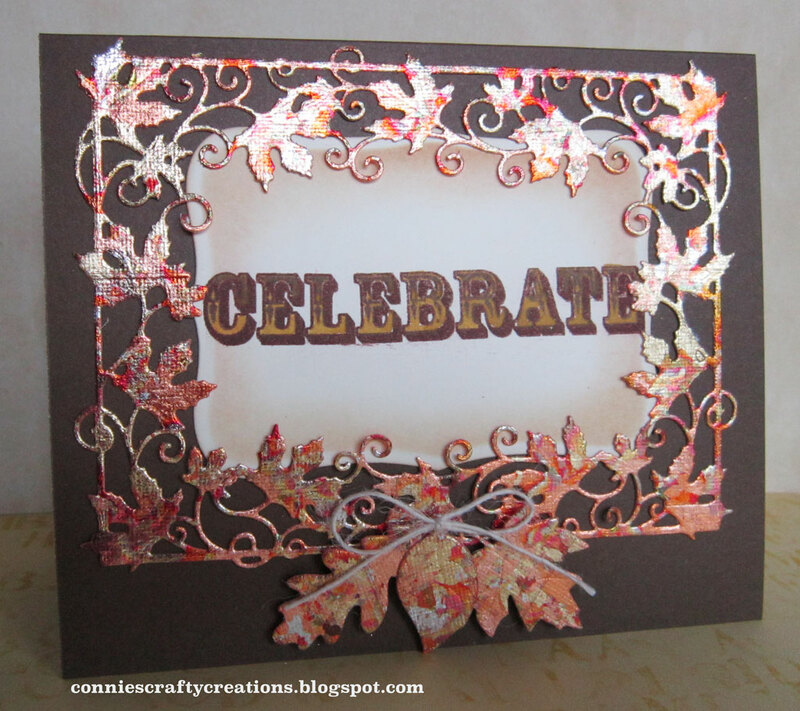 Beautiful Autumn card Connie! The mega flakes really highlight the vine frame, I love the colours and sheen they give. You have made me think I should get mine out and use them! Thank you for the tips too. WOW! I have never seen these bits of fabulous fun! Aren't they fantastic? 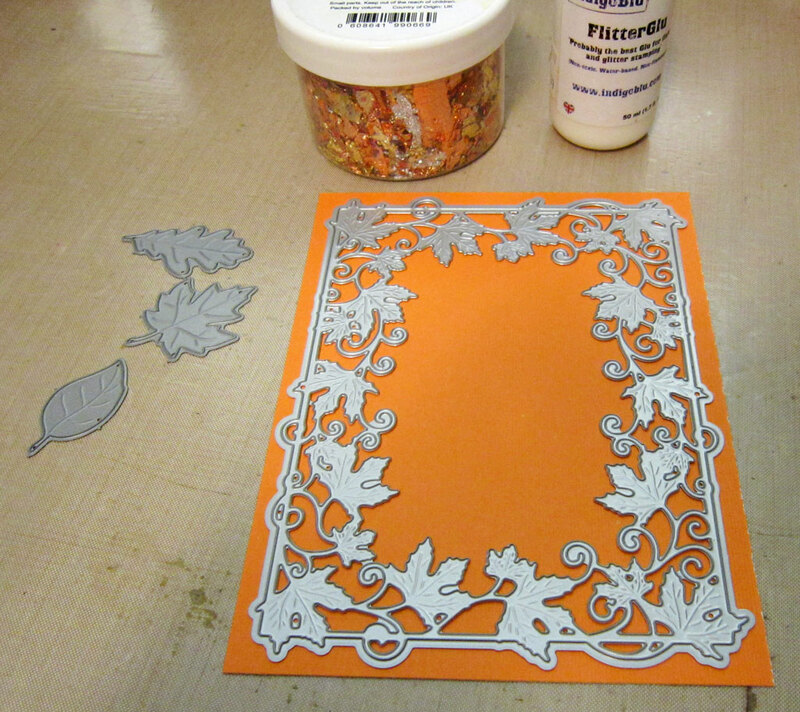 I really love that leaf frame it is just one of the pretties dies I have ever seen! Your beautiful card celebrates Fall in all of it's glory! Love it!!! 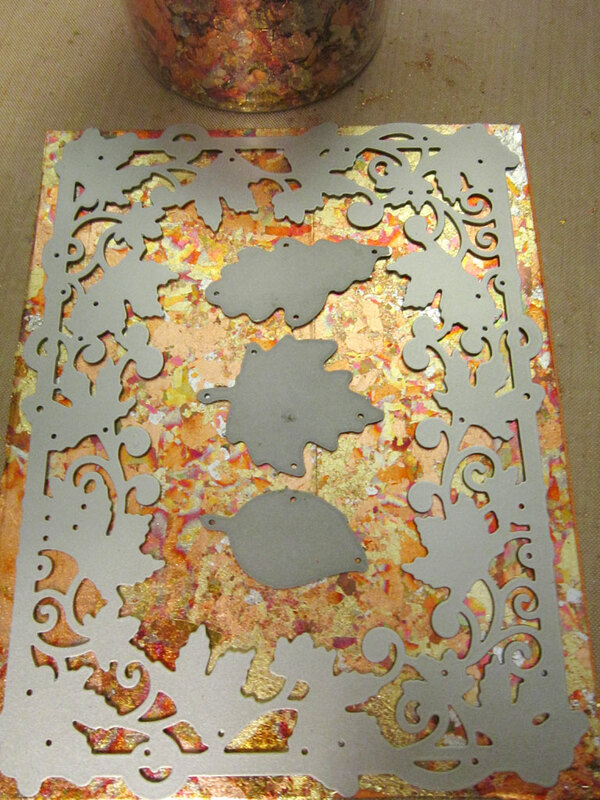 The leaf frame is exquisite and so detailed; it looks great with the gilding flakes that add so much shine to it. Very pretty card! Connie, don't you love these flakes. They look so beautiful on this frame of leaves. I have a couple myself. They are great for all kinds of creativity. Beautiul fall card. Mm, Connie, I had poor success with the glue, I've been told to apply it with a foam sponge in a thin application ...and not to put it on card stock, that's the secret a fine layer of glue is fine. Mine was rescuable but a lesson. 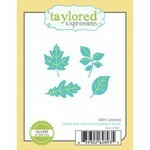 No leaf dies but love these. I've been buying the cheap dies on eBay, as they're affordable. Ones thus far are good, and great value. Take while to arrive though, been told seven weeks to Engkad but large snowflake one took two weeks, one that came today.